This research is concerned with developing a new business model for flexible small scale ceramic production that exploits the customisation capabilities of digital manufacturing technologies and the market potential and global connectivity of the world wide web. It is arguably of particular relevance to regional economic development in remote areas (Amin, Tomaney, Sabel) such as Cornwall where there is a culture of high quality small scale production, limited market and manufacturing opportunities that present a real need to develop businesses that connect with a global economy. The innovative ceramic surface patterns produced result from the development of design processes that exploit and challenge commonly accessible digital tools eg. mobile phone camera technology, CAD software tools in Adobe Photoshop and Adobe Illustrator, ‘magic wand’, ‘path’ and ‘trace tools’. The research also involves working with manufacturers and operators of digital ceramic print systems (Cuccolini and Digital Ceramic Systems) to develop methods for colour consistency and highest quality print production. 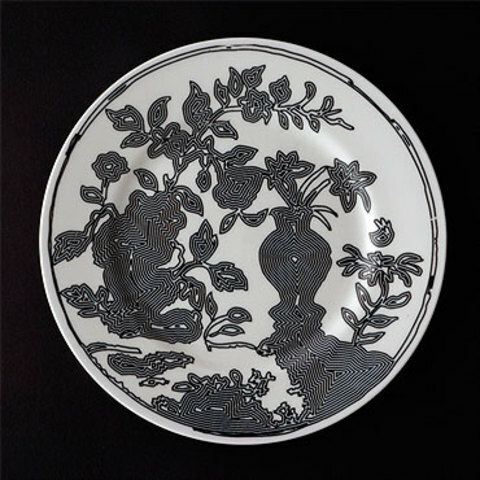 The project now involves the development of a website that enables people to interact with the process of selecting surface patterns for tableware and to create their own dinner service. This research is being carried out with international partners, Fluidforms (www.fluidforms.at), specialists in creating online design tools for 3D digital production processes (beta website in progress).